Power outages, disasters and other disruptions happen. And thousands of businesses around the globe are affected by them every year, with lost profits ranging into the millions, if not billions. So how can your business protect itself and stay open when the unexpected strikes? 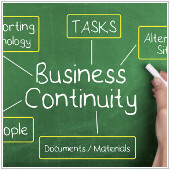 Here are five common business continuity strategies that many companies rely on. Today, companies are more dependent than ever on IT and their business data. If these critical components suddenly become inaccessible, can your business stay open? For most business owners, the simple answer is no. This is why backing up these elements is vital to your business’s success. Backing them up ensures they can be restored quickly in the event of a disaster, security breach, or damage to IT equipment. When you virtualize your servers or desktops, they can be used at any location – be it at your workplace, home, or a coffee shop in the Bahamas. In terms of business continuity, this is useful in case your main office suddenly becomes unusable due to a disaster such as a flood, a break-in, or if you’re simply unable to get there because of hostile weather conditions. Power outages essentially zap all your employees productivity. No electricity means no work. And that means you’re paying them to do nothing. Having a backup power supply like a generator will ensure that when the electricity goes down, your employees can continue working. A good solution is an uninterrupted power supply (UPS). When you have this, a power outage will not affect your employees ability to work. They can work seamlessly through it, as if nothing ever happened. Also, if you have a server room, the UPS will ensure your vital servers stay cool. Whether it’s Facebook, Twitter or Google +, most people are on at least one social network these days. And if there is any kind of weather-related disaster, social media is usually one of the first places customers, colleagues, staff and vendors will check to see the status of your business. This is because even if the phone lines or local power goes out, social media is usually accessible. So when it comes to business continuity, have at least one active social media account you use to keep your customers and followers informed. Unified Communication (UC) can essentially create a virtualized communication infrastructure. That means instead of your communication tools – like phones, instant messaging, video calls – all being stored locally at your workplace, you can access them anywhere. So for whatever reason if your office is inaccessible, employees can still use your phones and other communication tools from their homes. What’s more, UC tools can route business calls to your employees smartphones. That means they’ll never miss an important call, even if they’re not in the office. So there you have it, five tools to ensure your business operates continuously no matter what comes your way. If you’d like to implement business continuity technology in your business or develop a continuity plan, we’re happy to help.